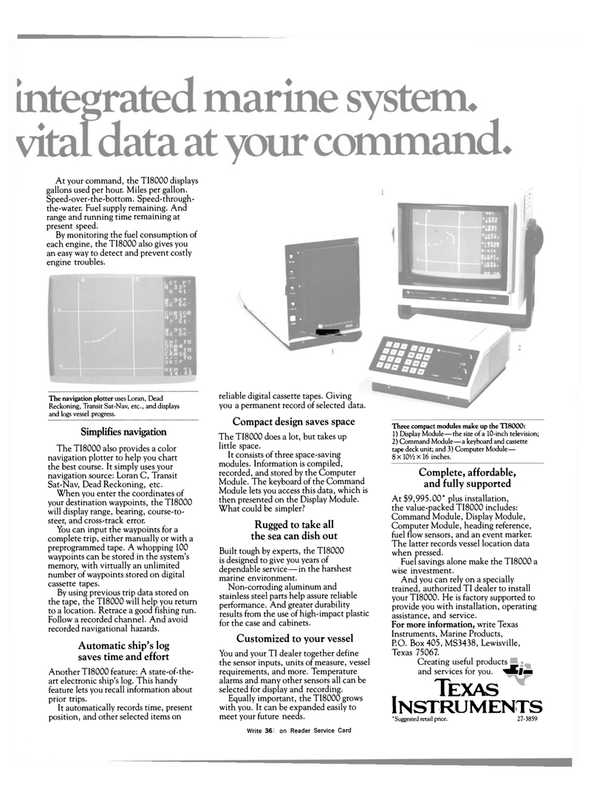 At your command, the TI8000 displays gallons used per hour. Miles per gallon. Speed-over-the-bottom. Speed-through- the-water. Fuel supply remaining. And range and running time remaining at present speed. By monitoring the fuel consumption of each engine, the TI8000 also gives you an easy way to detect and prevent costly engine troubles. Reckoning, Transit Sat-Nav, etc., and displays and logs vessel progress. When you enter the coordinates of your destination waypoints, the TI8000 will display range, bearing, course-to- steer, and cross-track error. You can input the waypoints for a complete trip, either manually or with a preprogrammed tape. A whopping 100 waypoints can be stored in the system's memory, with virtually an unlimited number of waypoints stored on digital cassette tapes. By using previous trip data stored on the tape, the TI8000 will help you return to a location. Retrace a good fishing run. Follow a recorded channel. And avoid recorded navigational hazards. Another TI8000 feature: A state-of-the- art electronic ship's log. This handy feature lets you recall information about prior trips. It automatically records time, present position, and other selected items on c • icM •m i 9 f 1 • a . * *T_ reliable digital cassette tapes. Giving you a permanent record of selected data. The TI8000 does a lot, but takes up little space. Module lets you access this data, which is then presented on the Display Module. Built tough by experts, the TI8000 is designed to give you years of dependable service—in the harshest marine environment. Non-corroding aluminum and stainless steel parts help assure reliable performance. And greater durability results from the use of high-impact plastic for the case and cabinets. You and your TI dealer together define the sensor inputs, units of measure, vessel requirements, and more. Temperature alarms and many other sensors all can be selected for display and recording. Three compact modules make up the TI8000: 1) Display Module—the size of a 10-inch television; 2) Command Module—a keyboard and cassette tape deck unit; and 3) Computer Module— 8 x lO'/z X 16 inches. Computer Module, heading reference, fuel flow sensors, and an event marker. The latter records vessel location data when pressed. Fuel savings alone make the TI8000 a wise investment. And you can rely on a specially trained, authorized TI dealer to install your TI8000. He is factory supported to provide you with installation, operating assistance, and service.